Wow! It’s August already, and our Summer Farm Camp season has come to a close. 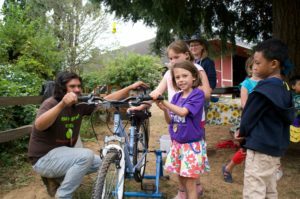 We’re sad to see it go, but excited to share some wonderful stories from this summer at Sauvie Island Center. We served 127 students across six weeks of camp this summer, more than ever before! 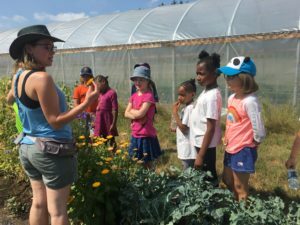 Together, our five amazing staff planted seeds with kids, made countless salads, held worms, did a lot of goofy dances, buzzed around like bees and so much more. 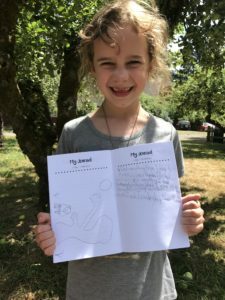 Here is Noli, showing us her journal entry of her favorite camp memory. Every day after lunch we do “Sit Spots,” a quiet time of reflection and writing. The campers each decorate a flag and tie it to their very own tree in the orchard, the same one they’ll return to all week. Campers (and staff!) love this peaceful time. Our incredible new bike blender and adorable camper Solveig! We didn’t get the bike blender working till Week 5 this year, but the two weeks we had it were great. We made hummus, peach salsa, green smoothies and soil smoothies (contrary to popular belief, not actually made out of dirt) with the bike blender, and the kids absolutely loved it. Cooking is one of the most unique and fun parts of farm camp, and the bike blender made it even more exciting! We had an amazing camp season this summer, and are already counting down the days till next year!